Schematic presentation of the nephron structure. Nephrons are functional units of the kidney, which found within the cortex and medulla of the renal lobe. Nephrons have a characteristic structure that includes a glomerulus and an epithelial tubule that loops down into the medulla and is compartmentalized into the proximal tubule, Loop of Henle and distal tubule. The renal corpuscle consists of the Bowman's capsule (parietal epithelium) which encloses the Bowman's space, the glomerular tuft and other elements that form the glomerulus. 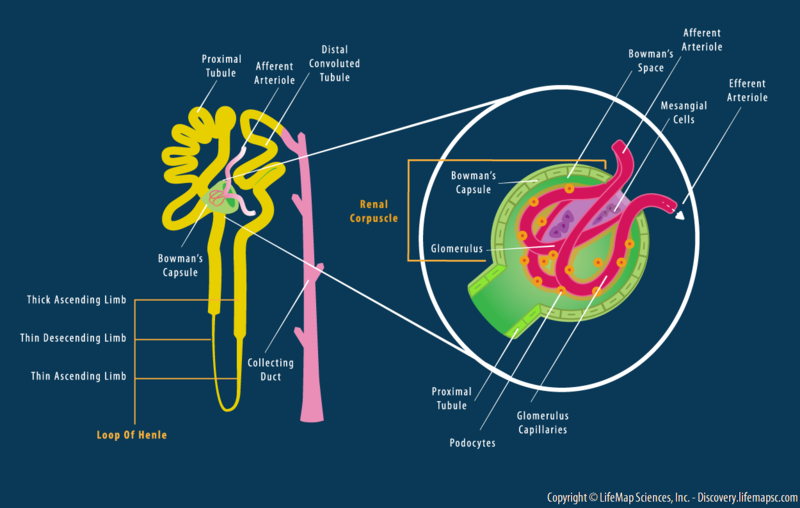 The glomerulus is the most proximal component of the nephron. It is comprised of a capillary tuft surrounded by highly specialized epithelial cells called podocytes (visceral epithelium) and mesangial cells, localized between the afferent and efferent arterioles. The Bowman's space collects the glomerular plasma filtrate as it leaves the capillaries through the filtration membrane.